Mine operators for some time now have been increasingly turning to an alternative to conventional rip-and-stack or drill and blast coal mining: the use of surface miners. Diverse studies and tests show that surface miners offer considerable advantages in terms of both economic efficiency and the final product. Wirtgen supplies surface miners in a variety of performance classes for the selective mining of commodities, such as coal, limestone, bauxite, gypsum, salt and phosphate. In addition to mining, these machines can also carry out routing operations for constructing roads and railway tracks, rehabilitating roadways and installing tunnel floors. The range of applications further includes the precision cutting of ditches and channels, as well as surface leveling. In collaboration with RWTH Aachen University, Wirtgen conducted a study in a black coal mine in Queensland, Australia. The 4200 SM surface miner was integrated into an ongoing operation for the selective mining of coal and interburden. Previously defined targets were checked regularly to determine if they were being met. The project score card illustrates the advantages of using a surface miner in this mine. The production rates of the surface miner were compared with that of the previously used rip-and-stack method over a period of four months based on various performance indicators. 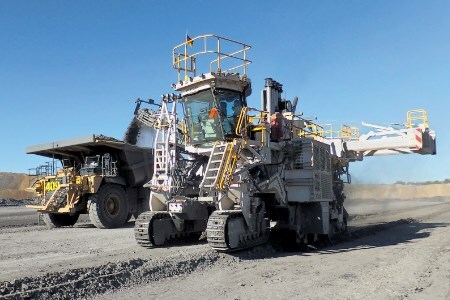 The conventional mining system comprises two supersize dozers for ripping and stacking the material and a super large wheel loader for loading it to dump trucks with payloads of 130 - 190 t.
Compared to the three mining machines used at the mine previously, using a surface miner significantly reduced noise emissions. Mining with the 4200 SM likewise has a positive impact on dust emissions. In contrast to the dozers and wheel loader – all of which generate considerable quantities of dust that impact the work environment – the dust produced by a surface miner is contained in the cutting drum housing. A dust suppression system comprising an integrated water spray system also helps to additionally reduce and bind the dust. An analysis of the two mining methods further demonstrated that fuel consumption is about 79% lower – and therefore also CO2 emissions – with surface miners than when using the conventional method. The lower number machines in use additionally has a positive effect on risk management, because fewer machines mean a reduced risk of accident at the mine. The surface miner’s anti-vibration cabin offers better ergonomics and optimised working conditions for the machine operator. The vibrations generated in the 4200 SM were rated as ‘low’ according to Australia’s AS 2670-2001 standard, while the ratings for the conventional systems were higher. For the study, a total of 100 samples (30 t each) were analysed during operation of the surface miner to determine the particle size distribution. Those samples were compared with similar ones taken from the conventional mining equipment and identical mining fields. Significant advantages emerged when working with the surface miner, which produced 14% fewer fines at grain sizes of less than 2 mm compared to the conventional mining system. The portion of fines to be processed dropped by 22% at grain sizes of less than 1 mm and even by 36% at grain sizes of less than 0.5 mm. Further savings were achieved by significantly reducing the quantity of oversize. In addition, working with a surface miner reduced coal mining losses and dilution of coal in the mine. This leads to more product, hence increased turnover and even an improved exploitation of the deposit and thus a better stripping ratio. Wirtgen surface miners can cut, crush and directly load material onto trucks or dumpers in a single operation. This saves time and the additional cost of purchasing machinery and fuel. The score card clearly demonstrated that, when the entire process chain is taken into consideration, mine operators benefit from tremendous cost reductions when using a surface miner. These reductions are not only a result of easier processing. The smaller number of mining machines and reduced manpower described above and the avoidance of additional costs for transporting and processing waste rock also contribute significantly to the good overall score achieved by the surface miner. Using Wirtgen surface miners delivers compelling improvements in final product quality, cost-efficiency, environmental protection and safety. In order to fully exploit the surface miners’ profit potential, an analysis should be conducted when starting the planning of a mining project. Full article first published in the July issue of World Coal magazine. To keep up with industry-related bylined articles, register for your free copy here.